Countdown’s 2008 Report was released in April 2008 at the 118th Assembly of the Inter-Parliamentary Union in Cape Town, South Africa, where Countdown to 2015 held its second international conference. The report, based primarily on data drawn from national surveys and global databases, measured coverage of basic health services proven to reduce maternal, newborn, and child mortality. It also assessed the strength of health systems, the status of policies related to maternal, newborn, and child health, and how equitably health services are distributed. The 2008 Report was Countdown’s first to encompass the full MNCH continuum of care. For this report, Countdown was expanded to cover 68 priority high-burden countries, and country profiles for these countries were published together with the report. Many countries have made rapid progress in preventing childhood illness, but vital clinical care for women and children lags behind. A functioning continuum of care can ensure no one falls through the cracks. Investment in life-saving services during the period before pregnancy and through two years of age is critical to maternal, newborn and child survival. Governments and partners must urgently address undernutrition. To reduce inequalities, health services must be targeted to the poorest. Investment and political commitment translate directly into lives saved. 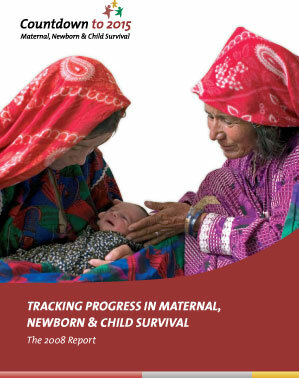 If maternal, newborn, and child survival is the destination, we need reliable data to guide our action. In a special issue timed to coincide with the launch of this report, The Lancet published a series of articles on coverage, equity, financing, and policy; a number of related commentaries; and detailed country analyses from South Africa and Tanzania. (Please note that errors have been corrected in PDF versions available for download above.